garden cress seeds recipes, Indian Halim Recipe. Garden cress seeds recipes are used in healthy drinks, Indian sweets. 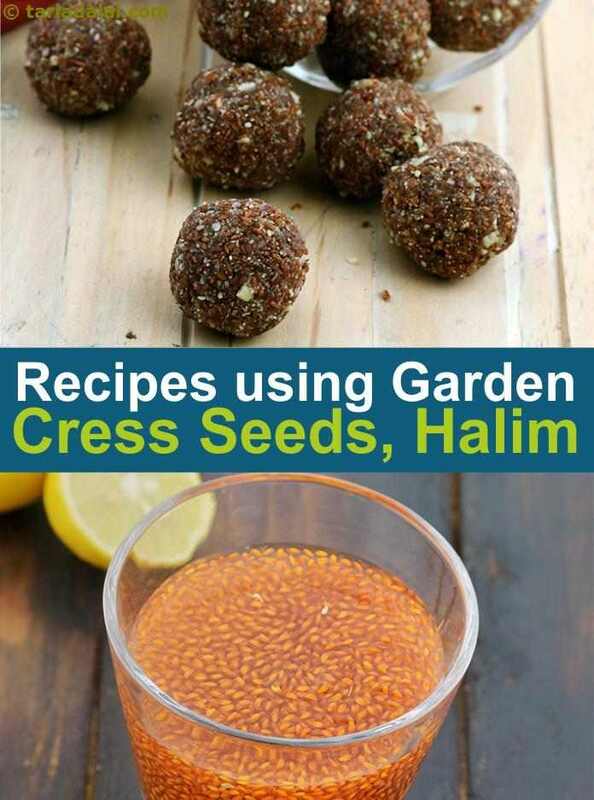 We have made a tasty Halim recipe drink by soaking garden cress seeds in lemon juice. The lemon juice not only makes the drink tasty but also gives a good amount of vitamin C, which improves the absorption of iron from this Halim Recipe. Yes, we have used garden cress seeds to make the famous Indian ladoo. Halim Ladoo recipe is a traditional Maharashtrian sweet made with iron-rich garden cress seeds. Other ingredients like jaggery and almonds also add to the iron quotient of these delicious ladoos. Aliv or garden cress seed is a real treasure-trove of nutrients, and a must have in every kitchen. This little-known Indian food is one of the best vegetarian sources of iron, and is worth including in the diet, whether as a powder or in seed form. This delicious Aliv Nutri Paratha recipe is a great way to start off. With a scrumptious stuffing of paneer and coloured capsicums, it is nothing short of a mouth-watering treat. True to the fact that garden cress seeds have many health benefits, do not go overboard with it. The recommended serving size would be 1 tbsp (12 gm) 2 to 3 times a week or as recommended by your doctor / dietitian. It contains some amount of goitrogens which prevent iodine absorption. Garden Cress Seeds (Halim) : Garden cress seeds overcome anaemia. A tbsp. of these seeds offer 12 mg of iron. Being rich in iron and a galactagogue (a food which enhances breast milk production), it’s beneficial for lactating moms for enhancing breast milk production. Its high protein content helps to satiate you and build muscle mass too. Garden cress seeds are a good cure to constipation. The fiber from the seeds when had with water helps to bind the stools and aids in its east movement through the digestive tract. See detailed benefits of garden cress seeds. Enjoy our garden cress seeds recipes, Indian Halim Recipes below.